AUSTIN – Today Secretary of State David Whitley issued a media release about new data obtained from the Texas Department of Public Safety (DPS) identifying those individuals with driver licenses or DPS personal identification cards as citizens or non-citizens. This announcement notes the potential that substantial numbers of non-citizens have voted in one or more Texas elections. The League of Women Voters of Texas (LWVTX) and many Texans are concerned about the security of our elections. We want clean voter databases and safe and secure elections. This report is an example of why we need to modernize our voter registration system. We could have one that automatically prevents non-citizens from registering. We do wish to call attention to the Secretary of State (SOS) Election Advisory No. 2019-02 that notes there is still an additional cross check to be run against the U.S. Citizen and Immigration Services’ Systematic Alien Verification for Entitlements (SAVE) database. Regardless, this advisory is concerning. 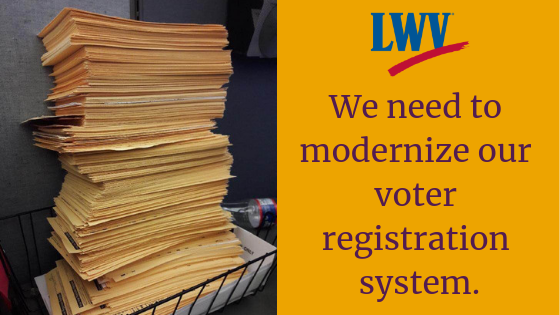 LWVTX calls on the Texas Legislature to address this issue by modernizing the voter registration system. There are multiple bills already introduced that can improve its integrity. Tying use of a continually clean and accurate DPS database of citizens/non-citizens is very doable. In a modern system with a large percentage of voters registering themselves online, the transaction is only accepted if all of their information matches their current driver license information (including the 20-digit unique code) or their personal identification card. The online process is already available to Texans who are renewing their driver license, and to citizens who are updating residential addresses for their voter registration if they are moving within the same county. Many other states are far ahead of Texas in assuring this accuracy. Some also automatically register citizens to vote when first receiving their driver license. The SOS Elections Division appears to be working responsibly to use federal funds received in 2018 to assure a secure and accurate a voter roll database and the highest level of voting system physical and cybersecurity. We also appreciate that the SOS Director of Elections’ advisory issued today emphasizes the due process necessary before counties eliminate voters from the voting rolls. Mistakes can be made, and citizens deserve the opportunity to correct them.